You might be eager to take a look at some examples so here is the demo page right away. And below you will find a short introduction. OK, so apart from the awful name, is there anything interesting about this tooltip plugin? You can, of course, tweak the margin/padding of the inner DIV if needed. With Poshy Tip you can position the tips relative to the mouse cursor or to the target element and align them in every possible way horizontally and vertically (note the alignTo, alignX and alignY options). 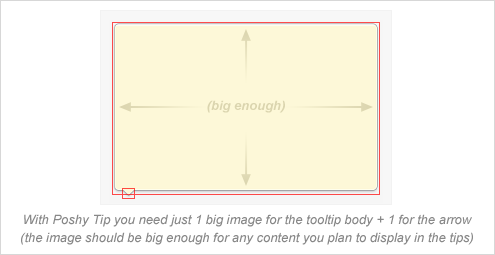 In addition the script makes sure the tips are always displayed in the browser viewport and also automatically positions the arrow (if available) on the appropriate side of the tooltip body. Poshy Tip supports using a function for returning the tooltip content and the script also passes an update callback function as an argument to this function. By using this callback, you can easily update asynchronously the content of the tooltip after it has been displayed. You can see a quick example on the demo page. You can find usage examples and a list of the options and methods available on the demo page. Like jQuery, Poshy Tip is dual licensed under the MIT and GPL licenses. Don't wait & subscribe to RSS or email updates now. Quick Tip: Sharing is also easy with the share menu below. Great page, previously been browsing forever and a day for ideas on the perfect rattan furniture pieces for our home and in our patio. for tips on the perfect rattan furnishings for our home and in our patio. of the direction and purpose of an organization concreted for everyone's view. turning off the power, and the water to the heater. In addition to these problems, installing fixtures such as toilets requires a process which, if not followed to the letter, may cause the DIY homeowner to remove the fixture and try again. I am creating a site from a template who's author used your poshytip code. I really like it but I have one small issue. When I have a really long form and an error occurs on a form field that has long been scrolled past (ie in no longer on the display) and the field received focus, the poshytip does not show next to the field anymore. If I scroll down, I see the poshytip elsewhere. Does this make sense? If so, any idea how to fix? those salons that are unable to afford the initial asking price in a single go. and decide if it is worth it. to do it for you? Plz answer back as I'm looking to construct my own blog and would like to know where u got this from.